Rarely, if ever, do I ever just randomly throw a post up on my website. But I felt compelled for some reason to show you what I had for dinner tonight. Chilean food often gets a hard time, and to be fair it’s mostly due to the fact that the food (steak) next door in Argentina is so good. I guess it’s a lot like being an American, it’s very hard to live up to the quality of your neighbour (Canada). 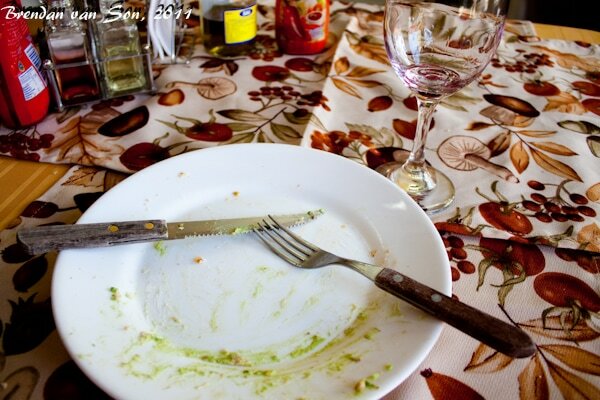 What Chile does do well in the food categories though are twists on classic dishes. It sounds crazy but one of the great Chilean meals is the hot dog. 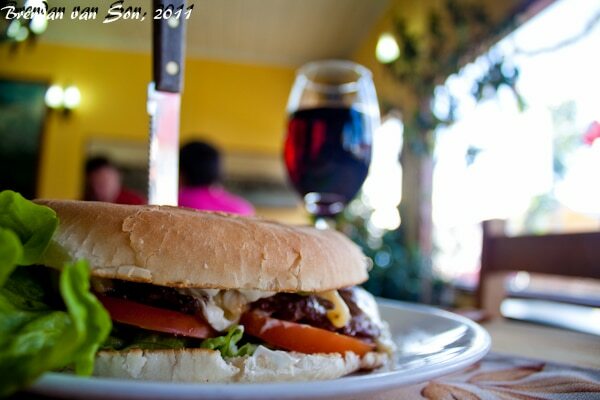 Another one is the churrasco sandwich, which is what I ate today. The churrasco completo is basically a version of the hamburger. Take a think slice of steak and top it with lettuce, tomato, avacado and cheese, and your fairly close to heaven. The meal photo essay I’m about to show below is of my churrasco completo, which came with a glass of house wine for a grand total of 8USD. 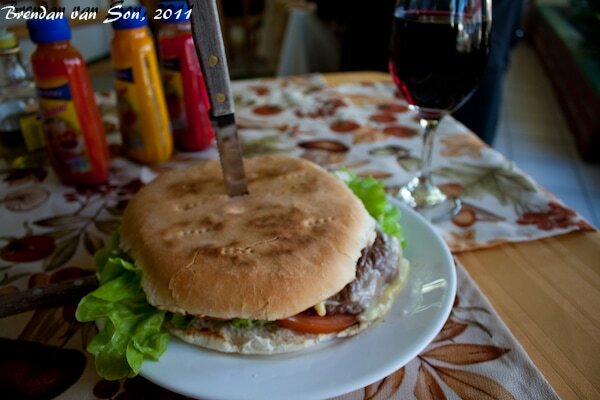 The churrasco sandwich was the size of a dinner plate and the wine full to the rim. Find below exibits 539-543 of why it will be hard to ever return home. Yeah !!! That is so true.. I was with a girlfriend at home in Natales.. I didnt want to go out for dinner so I suggest to order some churrascos with delivery.. she was a bit afraid of the cost of it… no problem… usd 2 !! Oh Brendan you certainly know how to woo your readers. I need to see more of the good stuff you eat! Churrasco , completo, empanada ñami ñami ñami i love them!! !